Dachis Group, the social analytics startup led by Jeffrey Dachis (who previously co-founded the interactive agency Razorfish), is launching a new product today aimed at helping marketers understand the true impact of their social advertising campaigns. Dachis Group claims to work with more than 50 percent of Fortune 500 brands, and CTO Erik Huddleston estimates that more than 60 percent of its customer base already runs social campaigns. He says the new Campaign Performance Monitor takes the company’s existing social data platform and customizes it to answer the questions that advertisers are asking. Specifically, he points to “the attribution problem” — figuring out what those social campaigns are actually getting you, and separating that from all the other conversation about a brand or topic that would be going on anyway. The new Campaign Performance Monitor, on the other hand, looks at where the content you’re trying to promote gets “injected into the social ecosystem,” Huddleston says, and it analyzes the conversation, aiming to link cause (the social campaign) and effect (all the comments, positive and negative, that it ultimately spurs). Other features include the ability to optimize a campaign in real-time, for example to emphasize a new theme if it seems to be resonating. You can also view and annotate timelines showing the progress of a campaign. 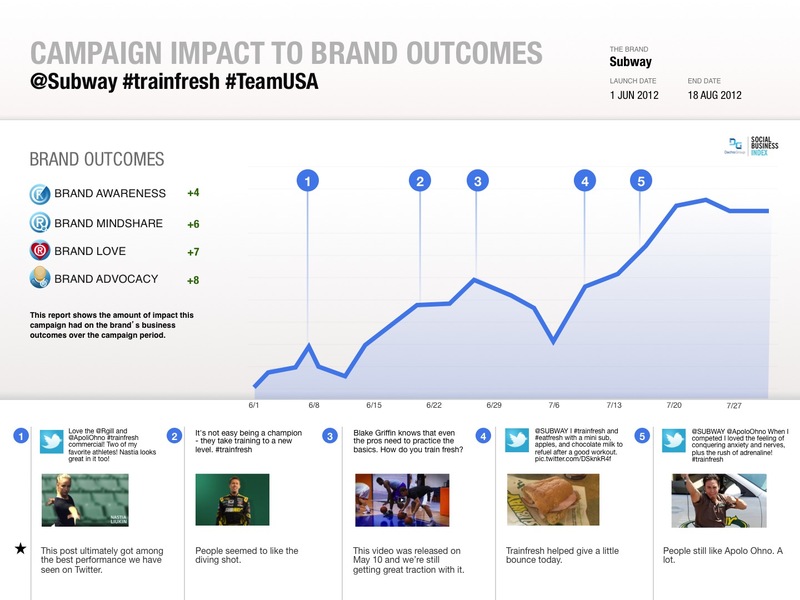 And at the end of the campaign, you can just hit a button and you’ll instantly get a PowerPoint slide (like the one below) that Dachis Group describes as “boss ready” — in other words, something you could easily slide it into a presentation for your boss about the effectiveness of a given campaign. This is Dachis Group’s fourth subscription software product. Earlier this year, it launched Advocate Insight to help brands find their most valuable fans.